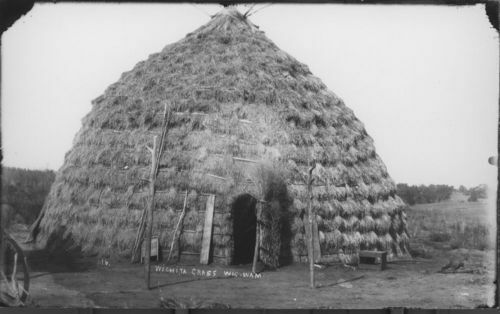 Grass house of the Wichita Indians near Anadarko, Oklahoma, is cone shape with a thatch of long grass laid in tiers that overlap like shingles. The Wichita have been identified historically with Quivirans that the Coronado expedition encountered in south-central Kansas in 1541. The group moved south into what is now Oklahoma early in the eighteenth century where they are located today.